Savion Glover has inspired a generation of dancers, not just tap dancers, dancers of all modern persuasion. In so doing he has kept the tradition of tap alive and taken it into the new millennium by blending the old with the new and coming up with something fresh and vibrant. Tap dance for everyone and judging by the demographic of the audience, everyone from young children to seniors were on hand. 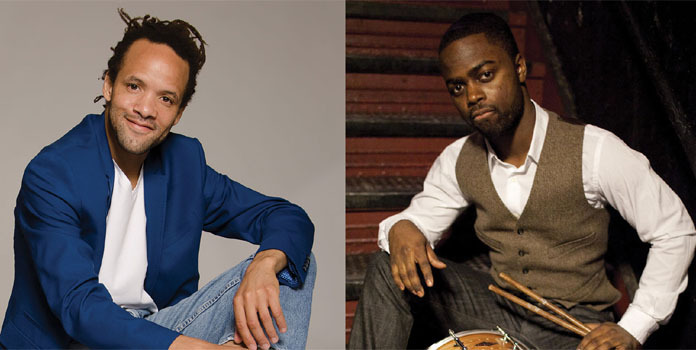 This nights performance would have Savion Glover teaming up with drummer Marcus Gilmore. Marcus Gilmore is an accomplished drummer, playing on numerous albums with many of todays jazz greats, Vijay Iyer, Ravi Coltrane, Steve Coleman and Chris Potter, to name a few. 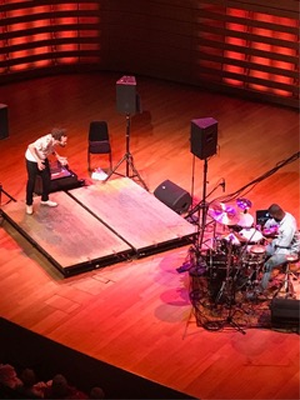 The stage at Koerner Hall had drums and a laptop on stage right and two raised platforms on stage left (tap stage), very close to the drum set. Three sound monitors stood on stands to the rear of the tap stage. A solitary high back chair stood at the ready, just to the rear of the left monitor. A mixing console, sound effects board or some other electronic device was placed near the tap stage, left centre. Allison Toffan of Toffan Rhythm Projects, an acclaimed tap dancer herself, made the introductions to the audience and made apologies for her nervousness and level of excitement at the close proximity to tap dance royalty. Savion Glover, heralded as the best tap dancer in the world and Marcus Gilmore heir to jazz royalty were welcomed to the stage with much applause. Looking very street, wearing a t-shirt, jeans and white runners Savion Glover approaches the tap stage, towel in hand. He glances at the adoring audience, he gives a slight nod of approval and removes the running shoes, replacing them with his tap shoes. Ready, he takes to the stage and makes a few test taps. Perhaps looking for the sweet spot, he starts tapping out a slow rhythm. 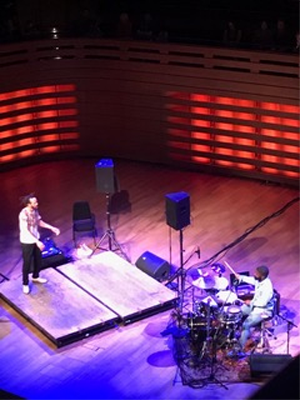 Marcus Gilmore, also dressed casually, has taken his throne and arranges his percussion effects, laying a linked chain over his snare drum and testing the snap of the snare. Savion locates his spot, to the front, left corner of the tap stage, he leans into it and starts to tap out rhythms. Rhythms and polyrhythms that would continue unabated and to the delight of a majority of the audience for ninety minutes. Some didn’t get it, perhaps they think Tap Dancing and Gene Kelly or Donald O’Connor comes to mind and this is what they were looking for. Marcus Gilmore played his drum set in support of what Savion Glover was doing with his two drum kits, Savion’s feet are like drum kits. They traded off licks, Savion doing single stroke rolls on his toes – his snare and Marcus Gilmore matching him with his left hand rolling on the snare. Gilmore had his drums tuned melodically, the bass drum open and booming with a great deal of overtone. The toms sang through his rhythms, he used his two hi-hats with bell cymbals in a delightful choppy manner. Gilmore introduced the laptop to produce synthesized sounds and the ambience took on a new level of mysticism. Haunting organ sounds that made me think of nature, forest sounds, accentuated by a woodpecker in search of prey. There is a simpatico between these two masters of rhythm, they speak in a language of their own. The interpretation of feelings through rhythm came out loud and clear. I could hear, feel and see that Savion Glover put his everything into his dancing. Many different emotions were on display. The longer he danced the more relaxed he seemed and the performance took on an otherworldly power. Midway through the show Glover picks up the microphone and begins to chant, he tapped out rhythms with his heels, toes, and every imaginable part of his foot. Marcus Gilmore responds with his own refined statements. Magic was created this evening and the high energy of the tapper and the drummer seemed electric. The show started with super fast and intricate tap dancing and it progressed to end with super fast tap dancing, building the energy to the grand finale. Savion jumps off his tap stage, the crowd is on their feet. Gilmore comes around to the front of the stage, a conference between the two to decide what to do next and a check on the time. The audience is giving the duo a standing ovation. They retake their positions and would perform another much shorter set. The show comes to an end, another standing ovation. Glover and Gilmore bow to the audience, Glover hugs Gilmore. One last wave and a hug to the audience and they are gone. A dynamic, inspirational show that hi-lighted the phenomenal footwork of Savion Glover and featured the very tasteful and melodious drumming of Marcus Gilmore. An independent journalist, based in Toronto, Canada. A professional musician and a fan of music, dance and the arts. I have written short stories, lyrics, poetry and reviews. I have been published in numerous online webzines. I’ve taught drumming and played in bands; I have felt the passion to create. I enjoy expressing that passion, the artistic experience, in words, reporting on the shows and musical experiences that I have witnessed.